Reagent toxicity was assessed by quantifying changes in stress response gene expression following transfection. A Venn diagram displays the commonality of transcripts with 2-fold or greater changes in expression in HeLa cells transfected with different transfection reagents for 8 or 24 hours. A substantially lower number of stress response gene expression changes are observed in cells transfected with either TransIT®-LT1 or TransIT®-2020 (red and green circles, respectively) as opposed to Lipofectamine® 2000 (blue circle). Mirus TransIT® Transfection Reagents Minimize the Stress Response in Transfected HeLa Cells. Stress-related gene expression changes were determined by RT-qPCR from total RNA samples harvested from HeLa cells that were transfected with TransIT®-LT1, TransIT®-2020 or Lipofectamine® 2000 at 8 and 24 hours. Eighty-four genes were analyzed using the Human Stress Response 96 StellARray™ (Lonza). At both time points, the number and magnitude of stress-related gene expression changes were lower when cells were transfected with TransIT®-LT1 or TransIT®-2020 than when cells were transfected with Lipofectamine® 2000. Transfections with TransIT®-LT1 or TransIT®-2020 Affect Fewer Core Pathways than Transfections with Lipofectamine® 2000. 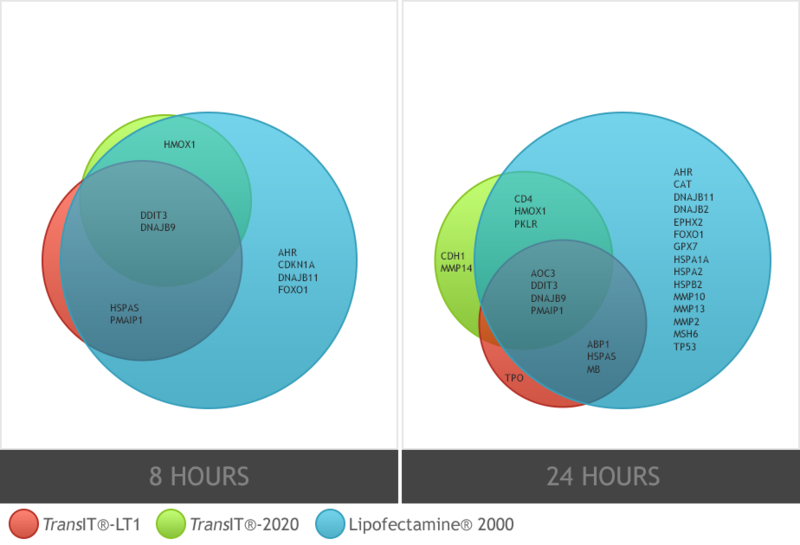 Canonical pathway enrichment analysis shows the primary biological processes impacted in HeLa cells that were transfected with TransIT®-LT1, TransIT®-2020 or Lipofectamine® 2000 at 24 hours. The negative log of the p values is the probability of obtaining these genes associated with the given pathways by random chance. The bar line at the bottom of each graph is derived from the ratio of the number of genes on our list associated with a given pathway divided by the total number of genes that make up that pathway. Pathway analysis was performed using Pathway Analysis (Ingenuity Systems). Representative data from two independent tests is shown.